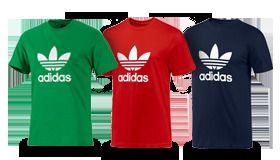 The Trefoil Tee from Adidas is one classic shirt. This sporty and stylish short sleeve t-shirt comes in a variety of colors, so take your pick. It is highlighted with the large distinctive Trefoil in the center. Wear it on the courts, the field, or the streets. This 100% cotton crewneck jersey has been in style for decades and will doubtfully ever go out.